The iconic No. 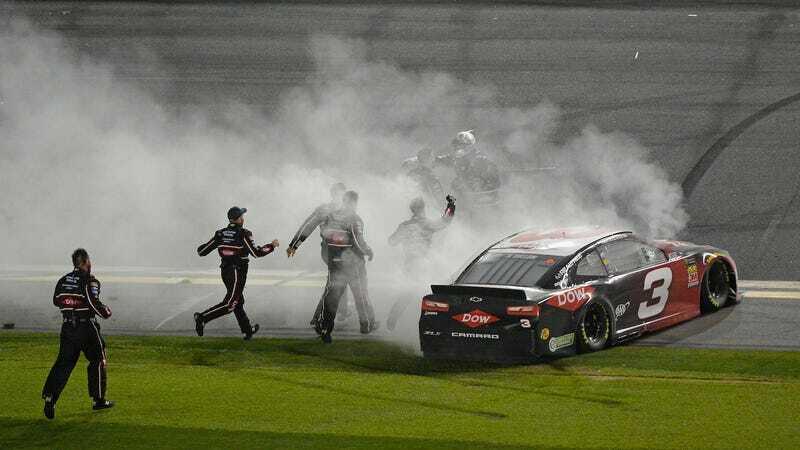 3 car won the Daytona 500 on Sunday, with 27-year-old Austin Dillon behind the wheel. 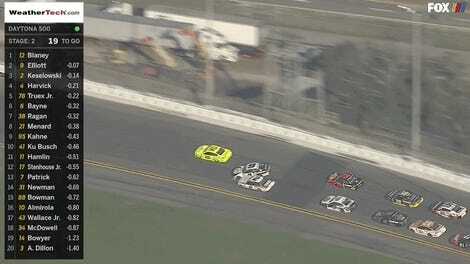 Dillon was in second on the final lap, when leader Aric Almirola spun into the wall in front of him. With NASCAR’s new championship format, Dillon will automatically be in the playoffs if he passes inspection. Dillon’s win in the No. 3 car comes 20 years after the late Dale Earnhardt Sr. won his only Daytona 500 with that number. Dillon won the race in NASCAR overtime after a huge wreck with two laps to go, when he took the lead from Almirola. The No. 10 car of Almirola was in the lead on the final lap, with Dillon behind him. Almirola admitted to blocking Dillon when talking to reporters after the race, and Dillon admitted to the spin—he told the TV crew that he “did what [he] had to do” and hated it for Almirola’s team, but that Almirola would “do the same to [him] in that position.” Almirola said he wasn’t mad about the wreck, according to NASCAR writer Jeff Gluck. Penske Racing driver Ryan Blaney dominated the race in the bright-yellow No. 12 car, leading 118 of 200 laps before finishing seventh overall. He was in and out of the lead in the final laps, until getting involved in the last wreck of the day that collected the front of the field and sent the race into overtime. The race restarted with 11 cars of the 40 cars on the lead lap in overtime, with 2016 Daytona 500 winner Denny Hamlin leading over Almirola, Chris Buescher, Dillon and Paul Menard. Neither Hamlin nor Almirola had a clear advantage through the first two turns after the restart, but Almirola took the lead before the final lap of the race and wreck in the third turn. He finished 11th overall. NASCAR officials let the field race to the checkered flag despite questionable overtime calls in the past, which was a win for everyone, including Dillon, who had a comfortable lead over second and third place when he crossed the line. That wasn’t the case for the rest of the field, with runner-up finisher Darrell Wallace Jr. barely beating Hamlin across the line. Crossing the line in second makes Wallace the highest finishing black driver in a Daytona 500, according to a tweet from Jayski.com, beating Wendell Scott’s 13th place in 1966.